Panellists from the education sector, the police, and local and central government were on the receiving end of some challenging questions, put to them by the pupils in Years 9 and 10. 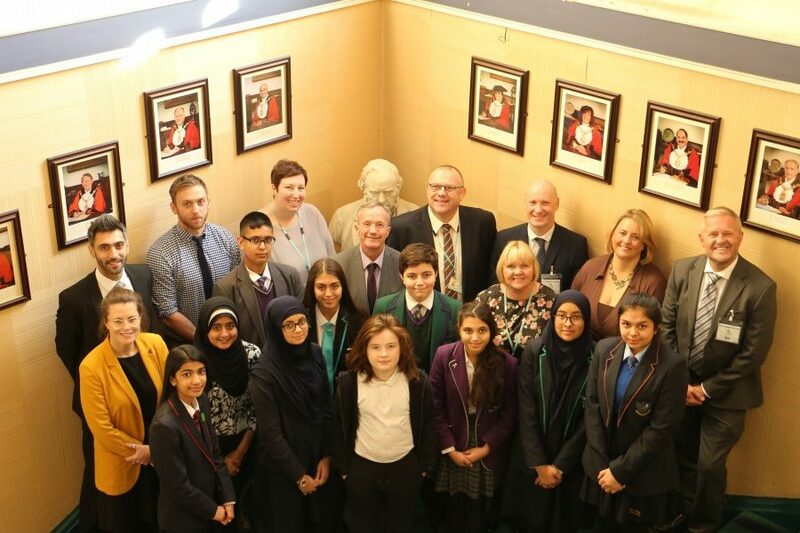 The Question Time event was the culmination of months of joint working between the pupils from schools in different parts of the borough, through the Schools Working Together project. This project has brought together around 50 pupils from the following schools: Our Lady & St John Catholic College, Pleckgate High School, Witton Park Academy, Islamiyah Girls’ High School, St Thomas’s Centre, Blackburn Central High School, and Westholme School. Since May, the pupils have been meeting up every six weeks to discuss the issues that they feel affect them the most. The 12 to 14 year olds have debated wide-ranging topics including crime and punishment, mental health support and social media. In the formal surroundings of the Council Chamber, dozens of questions were put to the panel, which included Liam Duffy from education charity Since 9/11, Counter Terrorism Police representative Gary Dunnagan, Paul Lee and Rebecca Ramsay from Blackburn with Darwen Borough Council’s Community Safety team and Imran Akuji from Children’s Services, and and a representative from the Department for Education. Deputy Youth MP Aliyah Shah was also in attendance. The thought-provoking questions covered themes of equality and multiculturalism, how to stay safe online and spot fake news, and radicalisation and extremism. The Schools Working Together project aims to bring together young people from different backgrounds who may otherwise have no opportunity to form friendships and working relationships with one another. Through collaborating on a shared project, they have developed their communication skills while discussing the issues that they feel affect them the most and exploring common views. To see them so confidently putting their questions to our panel at the Question Time event made me feel incredibly proud. They have handled some serious topics with real maturity and certainly given the adults plenty to think about by sharing their own opinions. The Question Time event was really interesting and it was good to have the opportunity to hear other people’s points of view. The panel members treated us like adults in how they answered our questions and gave us some examples in a formal setting. I thought that the questions the young people asked us were spot on. You could tell a lot about their understanding of some very complex issues by the quality of the questions they were putting to the panel. It’s very important that pupils from the borough’s schools are given opportunities to join together. This project has encouraged debate and discussion, and given these young people a voice to challenge adults in positions of responsibility to ask how they are going to support them on the issues that are of most importance to them. The seven schools will continue to work together as preparations begin for a Schools Working Together conference to be held at Ewood Park in March 2019. For more information on the Schools Working Together project, contact Blackburn with Darwen Borough Council’s Prevent Education Officer Leanne Romney on 01254 585270 or leanne.romney@blackburn.gov.uk.